Michelle's career in professional concert sound spans more than 25 years. She has been FOH Engineer for a diverse roster of musical acts. 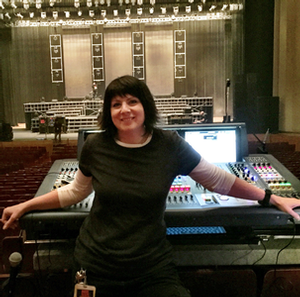 After starting her touring career mixing the band Spin Doctors in the early 90s, Michelle has done numerous world tours as FOH Engineer for some of the most recognizable names in music including: Styx, Gwen Stefani, Goo Goo Dolls, Melissa Etheridge, Christina Aguilera, Indigo Girls, Adam Lambert, Mr Big, Natasha Bedingfield, Big Time Rush, Ke$ha, Jewel, Collective Soul, and more. Michelle has participated as a panelist in the 2005 Pro Production conference -”FOH and Monitor Mixers, Does it Take Two?”, at AES 2001 as a mentor for the student program, and at AES 2012 on the “Women of Live Sound” panel. In 2013 she co-founded SoundGirls.Org with fellow live sound engineer Karrie Keyes for which she has written numerous articles on topics ranging from career development to live sound techniques. Michelle has also contributed to professional journals such as Live Sound International, Load In International, and various industry websites. She is a 2015 inductee in the Full Sail University Hall of Fame.